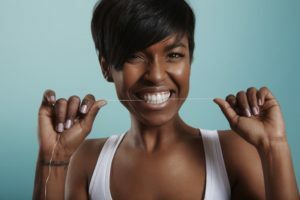 Why Do I Have Bleeding Gums in Carrollton When I Floss? You understand that along with brushing your teeth, using dental floss to clean the hard-to-reach places is essential to your oral health. Thus, you’ve recently committed to flossing on a consistent basis. You’ve noticed your gums bleed when you perform oral hygiene, though. Is that normal? Keep reading to get the answer as a local dentist explains some of the possible reasons for your bleeding gums in Carrollton. If you’ve recently started flossing, you’re likely to notice some bleeding. That’s because it’s a new activity that your gums have to adjust to. Usually, it will subside within two weeks after your first session of flossing. If the bleeding continues, it could be a sign of gum disease, though. When plaque is allowed to gather along the gum line, it can eventually work its way beneath the gum line to cause germ pockets to develop. Over time, this can cause inflammation, bleeding, swelling, puffiness and gum sensitivity, which are some of the initial signs of gum disease. The first stage of the condition is called gingivitis, the phase at which it’s critical to receive treatment. That’s so you can avoid permanent damage to the ligaments, tendons and bone that hold the teeth in place. Use a toothbrush with soft bristles to lessen the chances of irritating your gums. Hold the toothbrush at a 45-degree angle away from your gums when you’re brushing your teeth. When brushing, move the toothbrush with slightly-circular movements to preserve your enamel and to avoid damaging your gum tissue. It’s best that if you notice your gums bleeding, you reach out to your local dentist for an examination. By having a bird’s eye view, the professional will be able to tell what the source of the problem is so you can receive the most effective care and sound advice. Additionally, when you visit for preventive care, you’ll receive a thorough cleaning to remove any plaque. Then, when the examination and cleaning are done, you’ll be able to sit down with your dentist in Carrollton to go over the results. By taking action at the first sight of bleeding gums, you can receive a proper diagnosis. Then, if any restorative care is needed, you can receive it in a timely fashion so you can enjoy a normal and healthy life. Dr. Rajiv Shekhadiya is a graduate of New York University. He has since gone on to provide effective and compassionate care to his patients. To stay current of any new breakthroughs in dentistry, Dr. Shekhadiya maintains professional affiliation with such organizations as the Texas Dental Association and the Dallas County Dental Society. He practices at Celebration Family Dental, and he can be reached for more information through his website. Comments Off on Why Do I Have Bleeding Gums in Carrollton When I Floss? Complete this simple form and a member of our team will be in touch shortly.